I’m really pleased (and a little bit in shock still) to announce that my book, From ME to You, With Love is available to buy on Amazon, both in paperback and for the Kindle! For anyone who is thinking ‘what on earth is she talking about?’, getting on for a year ago now I was out talking to a friend. I was telling her about how difficult it is to manage with ME, not only your physical symptoms but the stigma and disbelief you can be faced with, and how that can make every day so much more of a battle. I can remember saying to her ‘it’s a shame that there isn’t something that has LOADS of us telling the world how it is’. Then I thought that maybe I could try and achieve that, create something where we told the world just how devastating ME can be but also how, thanks to people like IiME there is a real sense of positivity and determination within the ME world that one day a cure or treatment will be found. That’s when the ‘Letters for Louise’ project started. I asked my friends initially to write a letter (anonymously if they wanted) addressed to anyone who had showed them disbelief, a lack of respect, neglect, misunderstanding… or the notorious ‘I don’t think you’re as ill as you say you are, because you don’t look ill’. 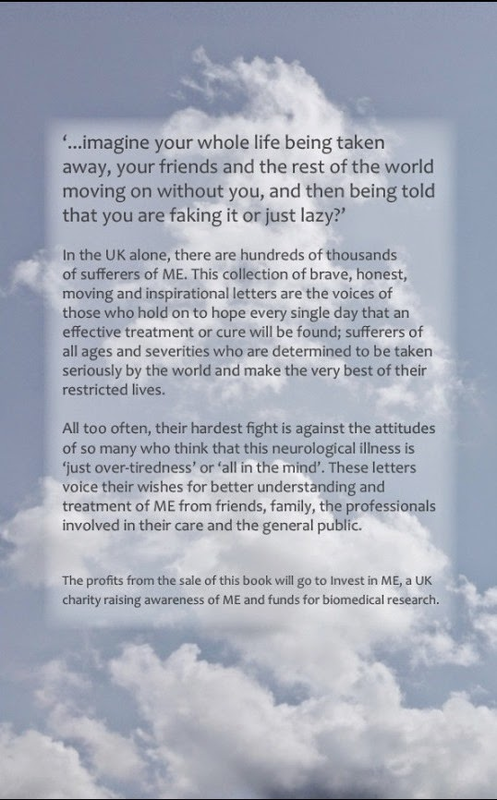 I planned on putting it all in Word, printing it off and giving it to a few family members and friends, but then I thought ‘why not make this bigger and raise money for IiME in the process’? So I decided to make a book. I had no idea how to publish it, or if I would be able to publish it at all- but I just decided to ask loads of people for letters and work out the rest later on. I wrote a few letters too, and found it really therapeutic so I hope that the whole process helped those who contributed. As time went on, the book started to take shape. Now, I had letters from people thanking others who had been so brilliant towards them. I had letters from people who were being so inspirational and crafting something amazing out of their massively restricted lives. I had letters of love, anger, pain- all of which were so raw and honest, and so heart-breaking. And so, as I began to put the letters in order, proof-read and check them all over, tissues were regularly added to the weekly shopping list! Now I am so proud to share what has been a very hard, emotional but brilliant journey. It’s been really tough at times reading other people’s stories, especially when they have made me reflect on my own experiences of having ME. But it’s been inspirational and an honour to work with what I think are some of the bravest people ever. I’ve made new friends and I want to thank EVERYONE for their support, not only with writing letters but for giving me so much love and encouragement too. I’m 25 and I’ve had ME since my late teens. I hate it. But this has just shown me that having it doesn’t have to stop your life there and then. I mean, I’ve just published a book… would I have ever thought of doing that if I didn’t have ME?!?!? Anyway, this is DEFINITELY not the end of the ‘Letters for Louise’ project, just the beginning. There may well even be a volume 2 at some point… although I need a bit of a rest first J For now, I’m really looking forward to sharing and promoting the book as widely as I can. I never thought in my wildest dreams that I’d publish a book so now I am going to believe that I can take this as far as I possibly can… and see if I can get some really high profile people to read it and help us in our battle to be taken seriously. If you don’t try, you don’t know! I hope you enjoy the book and thank you for all of your support!